أعضاء مشتقة من الأديم الظاهر. Section through embryonic disk of Vespertilio murinus. الأديم الظاهر هي الطبقة الخارجية من طبقات التبرعم وينتج منها الجهاز العصبي المركزي والجلد وعدسة العين والقرنية وغيرها الكثير. ^ Priolo، M.؛ Laganà, C (September 2001). "Ectodermal Dysplasias: A New Clinical-Genetic Classification". Journal of Medical Genetics. 38 (9): 579–585. PMC 1734928 . PMID 11546825. doi:10.1136/jmg.38.9.579. ^ Pispa، J؛ Thesleff, I (Oct 15, 2003). 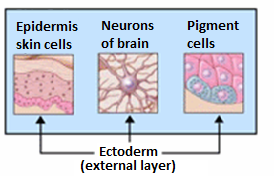 "Mechanisms of ectodermal organogenesis.". Developmental Biology. 262 (2): 195–205. PMID 14550785. doi:10.1016/S0012-1606(03)00325-7. ^ O'Rahilly، R؛ Müller، F (1994). "Neurulation in the normal human embryo". Ciba Found Symp. 181: 70–82. PMID 8005032.